Five expert tips to make the best, healthiest iced tea. Baby, it’s hot outside. 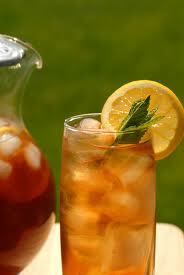 And a perfect drink to cool down is a frosty glass of iced tea. Plus, as Joyce Hendley reported in the July/August 2011 of EatingWell Magazine, studies show if you drink tea regularly, you may reduce your risk of Alzheimer’s and diabetes, plus have healthier teeth and gums and stronger bones. How? Tea is rich in antioxidants called flavonoids, which are most potent when tea is freshly brewed. Another benefit of brewing your own iced tea? When you make your own iced tea at home instead of using a powdered mix or buying it bottled or from a fast-food restaurant or coffee shop, you’ll save money. Plus you can control the calories by limiting how much sweetener you add (or by not adding any at all). Hendley talked to co-owner and tea sommelier at New York City’s Tavalon who recommended these 5 tips for making perfect iced tea. Look for fresh tea at a tearoom or a market with high turnover, because the oils that give teas their flavor break down over time. Opt for loose tea rather than tea bags, as tea leaves need room to expand to release their flavors. If you use tea bags, look for larger ones shaped like pyramids, which give the leaves more room to bloom. Look for brands that list the region where the tea comes from so you know exactly what you’re getting. Get this recipe for Hibiscus Promgegante iced tea. Mineral water contains too many minerals that can create off-flavors when they come in contact with compounds in the tea leaves, and mineral-free distilled water produces a flat-tasting brew. Use boiling water (212°F) to brew black, herbal and darker-colored oolong teas. But use cooler water (170° to 180°F) to brew green, white and lighter oolongs teas. Brewing teas that need cooler temps with boiling water can result in bitter or astringent flavors. Use 1 1/2 to 2 teaspoons per cup of water when brewing teas with bigger leaves or flowers, like green tea or chamomile, and 1 teaspoon per cup for teas with denser, compact leaves, such as most black teas. If you want to make iced tea and don’t have time for the tea to cool down, brew it double-strength to compensate for the resulting water from melting ice cubes. Or cool it to room temperature and refrigerate until cold. Heartier teas, like black teas and darker oolongs, should steep for 3 to 5 minutes, while green, white and lighter oolong teas need just 2 to 3 minutes. Herbal tisanes and infusions have fewer tannins, so there’s less risk of oversteeping.